The United States and Australian militaries are no strangers to one another. The relationship began when troops from both forces shared trenches in WWI, and continues to this day as they conduct joint patrols of the mountain passes of Afghanistan. Though the ties between our two nations remain strong, the need to maintain and grow interoperable skill sets never decreases, hence, the many joint-training initiatives that have occurred between U.S. and Australian forces over the years. 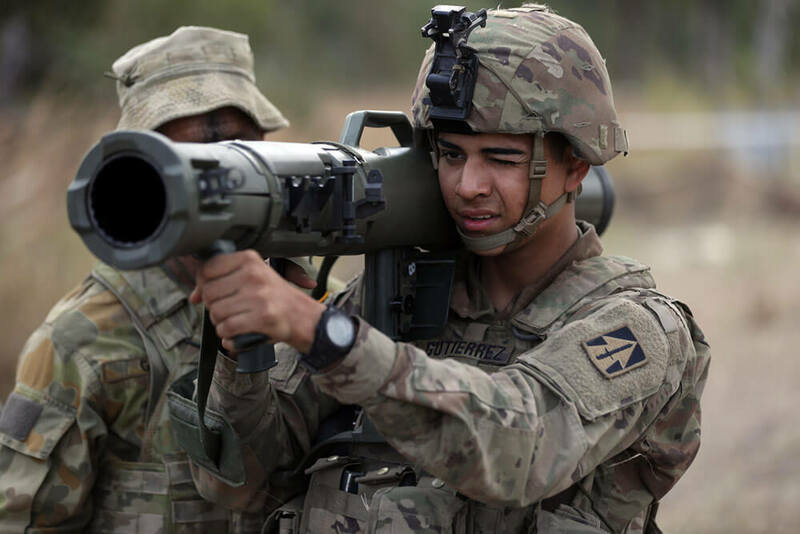 In June and July of 2018, roughly 800 American service members – including Soldiers from the Indiana Army National Guard – and 6,000 Australian soldiers trained together at Exercise Hamel. 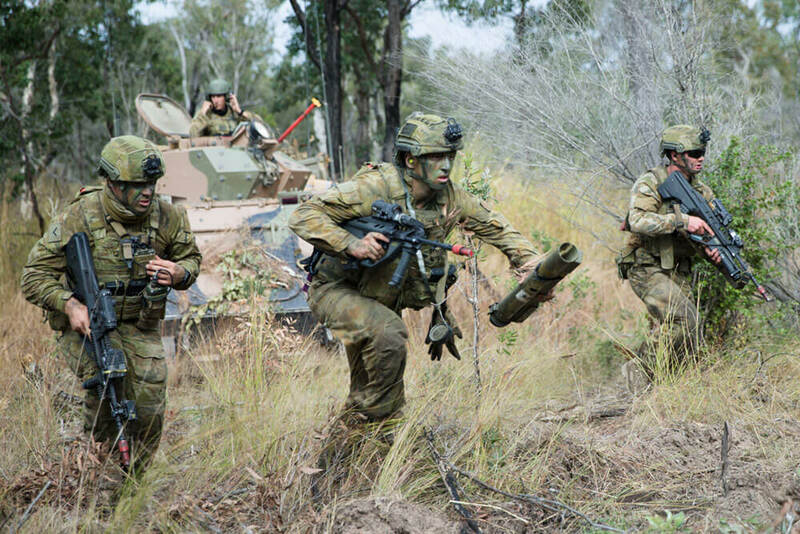 Designed as the Australian Defence Force’s (ADF’s) final event in the brigade certification process, Exercise Hamel serves as an ongoing opportunity to evaluate the warfighting ability of Australian brigades, while also improving interoperability with American troops. Exercise Hamel commemorates the WWI battle when, 100 years ago, U.S. and Australian forces first fought side by side as they defeated German troops in Le Hamel, France. The fields of battle have changed in the days and decades since that battle, but one thing remains the same – together, the United States and Australia make up a fine and formidable fighting force. In the 2018 iteration of Exercise Hamel, Indiana Guard Soldiers from the 1st Battalion, 293rd Infantry Regiment, 76th Infantry Brigade Combat Team (IBCT), trained with soldiers from the ADF’s 7th Brigade at the Shoalwater Bay Military Training Area in central Queensland, Australia. The training would ultimately certify the Australian brigade for deployment, and also function as the annual training requirement for Indiana’s 76th IBCT. Also participating in the exercise were U.S. Soldiers from U.S. Army Pacific, including the 25th Infantry Division, based out of Hawaii, and the U.S. Army 10th Regional Support Group, based out of Okinawa, Japan. U.S. Marines taking part in Exercise Hamel included the III Marine Expeditionary Regiment, also based out of Okinawa, and the 2nd Battalion, 4th Marines, 5th Marine Regiment, based out of Camp Pendleton, California. During the exercise, Indiana Guard Soldiers executed defensive tactical maneuvers, protecting the 7th Brigade’s flanks with blocks and delays as the units moved west through a 1,754-square-mile training area. CPT Bolin went on to explain that control was accomplished by strategically positioning notional obstacles and ensuring those obstacles were covered by fire. Exercise Hamel involved a hearty scenario that delved into several different training areas. The 76th IBCT engaged in tasks that included guarding artillery and other logistical positions, clearing routes and performing area reconnaissance, as well as securing enemy prisoners and serving as a reserve force to the 7th Brigade. 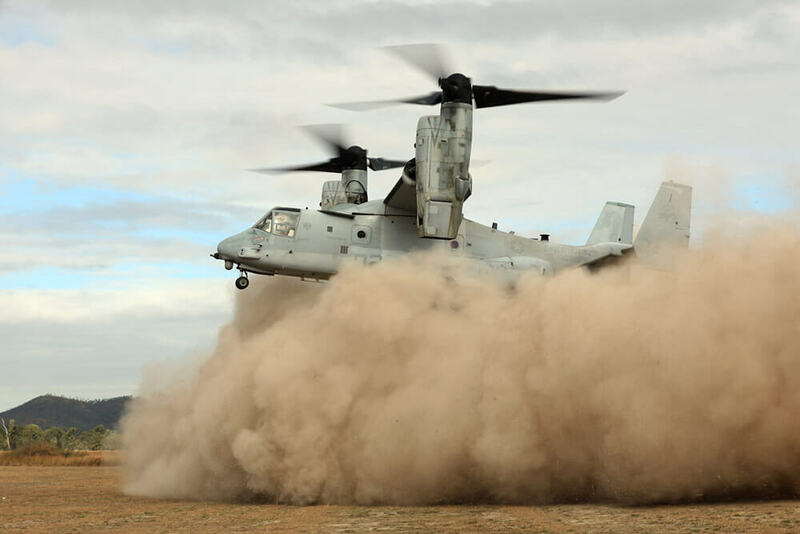 “We had a number of great scenarios involved, from non-combatant evacuation operations to an amphibious tactical lodgment [landing], to population security operations and high-end joint land combat. On all accounts, it’s been a fantastic get-out for our ADF,” said ADF Brig. Gen. Ben James, director of General Training and Doctrine. The mix of scenario types gave the U.S. and Australian participants plenty of opportunity to conduct joint field operations and share not only standard techniques, but also a few unconventional, yet highly effective, approaches. SFC Troy Shea, senior communications security (COMSEC) account manager for the 76th IBCT HHC, recalled a joint training covering best practices for the Harris High-Frequency Radio, which is employed by both forces. SFC Shea went on to remark about how this unexpected example of using any and all available assets demonstrated the true potential of a very common piece of equipment. At one point in the exercise, in the darkness of an early morning, Soldiers from Alpha Company of the 1-293rd, along with U.S Marines from 2nd Battalion, 4th Marines and ADF soldiers from the 6th Royal Australian Regiment, played the role of the Blue Force (BLUFOR) and overtook an urban objective being held by soldiers playing the role of oppositional forces (OPFOR). “They needed to clear a village with a mixture of insurgent forces, conventional forces and a significant number of civilians,” said ADF Capt. Tom Patterson, who served as an observer and trainer for the exercise. That mission put participants to the test. It required infantry, military police with police dogs, engineers, air support and other forces to take the contested area. While acquiring the target was the main goal and focus, ensuring the welfare of civilians was also a responsibility of every participating service member. It was realistic training for real-world battles in urban areas where determining who is an enemy and who is a noncombatant can be a challenge. 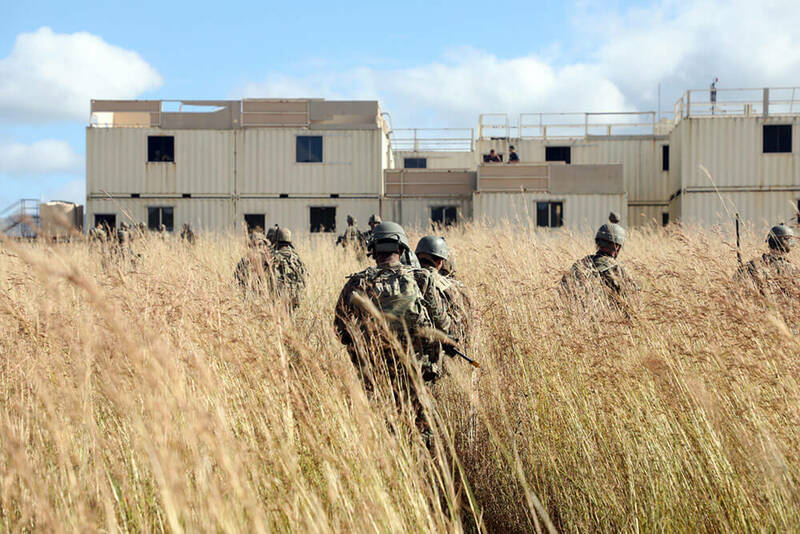 Exercise Hamel culminated with a simulated battle where U.S. and ADF troops, playing the role of BLUFOR, took over an airfield held by elements from the ADF’s 3rd Brigade, who acted as OPFOR. The scenario played out as a large-scale, combined-arms battle employing tanks, dismounted infantry, air support, artillery and unmanned aerial vehicles to get the job done. Hamel also gave the ADF the opportunity to demonstrate some of its newest equipment including their air force’s C-27J Spartan, the LAND 121 protected mobility vehicle, three separate digitized logistics common operating picture systems, vehicle camera systems, a fuel distribution and monitoring system, an automated base refueling point, an expeditionary fuel installation system for aviation and a programmable or manual-control precision aerial delivery system. Ultimately, Exercise Hamel boils down to two things – increased readiness and interoperability. MAJ Michael Delp, senior administrative officer for the 76th IBCT, spoke about how Exercise Hamel helped the Indiana Guard Soldiers in these two areas. 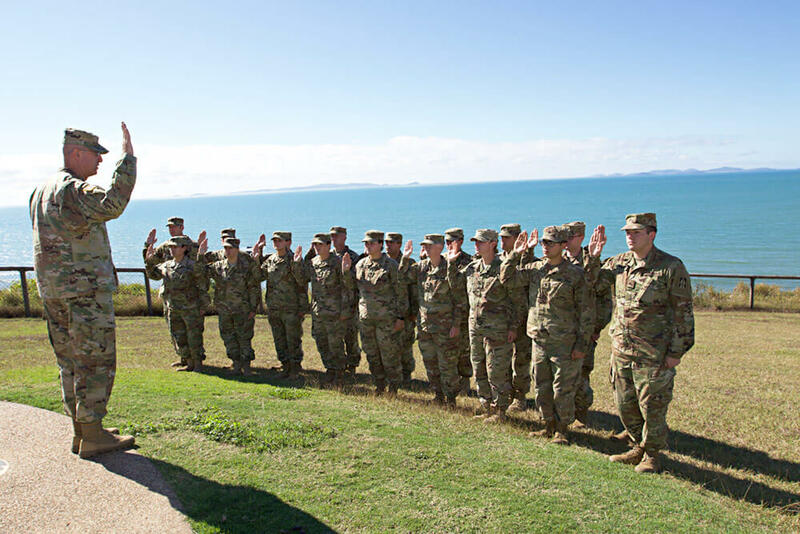 As U.S. and Australian soldiers continue to train and fight together, they have become an example of what long-term, historic partnership looks like.